Grab a fun gift for anyone with an offer this week at Restaurant.com. 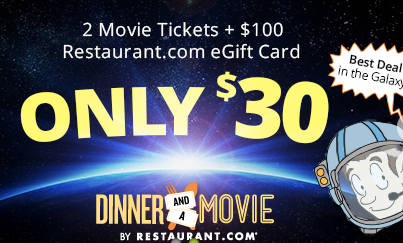 They have a deal giving you two movie tickets and a $100 Restaurant.com voucher for $30. In my area the movie tickets are worth over $25 alone so you are getting a great discount on dinner! Restaurant.com vouchers are good to buy an local dinning offer they sell. You pick the restaurant you want to eat from their list. You can use the $100 voucher to buy smaller certificates to the restaurant of your choice. Keep in mind that you’ll still owe something towards your dinner. The certificates are usually for $25 off any $35 purchase or similar offers. The dinner and a movie offer is good through 12/25. You can print out the certificate after you purchase and give it as a gift without worry about shipping!